The Best Kanye Diss of All Time! Kanye West is fair fodder for ridicule after his rude stunt at the MTV VMA awards. Yo, Kanye, I'm really happy for you and I'mma let you finish -- as soon as the world gets a chance to make fun of you on this cool new website. 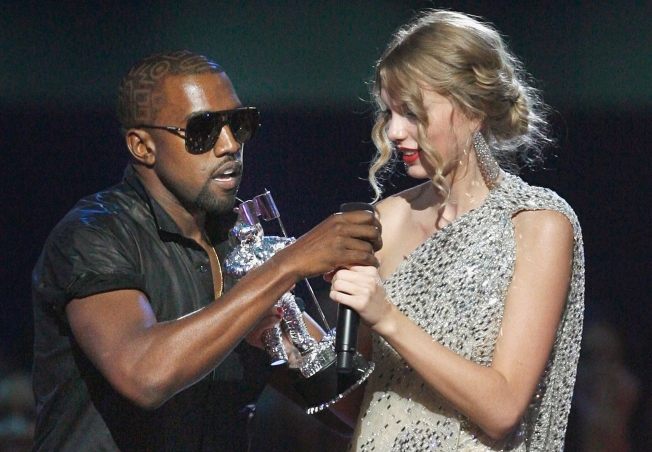 Kanye West's widely publicized VMA outburst has inspired a hilarious new meme which lets viewers post random photos with the caption, "I'mma Let You Finish." So far, more than 200 posts have gone up, prompting site host Tumblr to limit posters to one per day. There's one with the Jonas Brothers and West saying "Yo Jonas Brothers, I'm really happy for you and I'mma let you finish, but Hanson is the best brother group of all time!" Another shows Britney Spears in one of her lower moments, bald and hitting a car with an umbrella as West looks on saying, "Yo, Britney, I'm really happy for you and I'mma let you finish, but, actually please finish, I'm terrified of you." Others get a little more philosphical, like one with Plato being confronted by West jeering "Yo Plato, I'm really happy for you, I'mma let you finish, but Socrates was the greatest philosopher of all time!" West insults inanimate objects as well, including computer and game systems, even meteorological occurences, like one where Kanye disses a hurricane, telling it that "Katrina had one of the best landfalls of all time!" The theme of the posts originate from the rapper's dramatic stunt this past week where he jumped up on stage and took the microphone from country singer Taylor Swift while she was accepting an award for best female video, rudely stating Beyoncé should have won. He has since publicly apologized to Swift four times, and Swift has said she accepts.